Rarely do volcanologist get to watch the birth, growth, and death of a volcano. Paricutin provided such an opportunity. 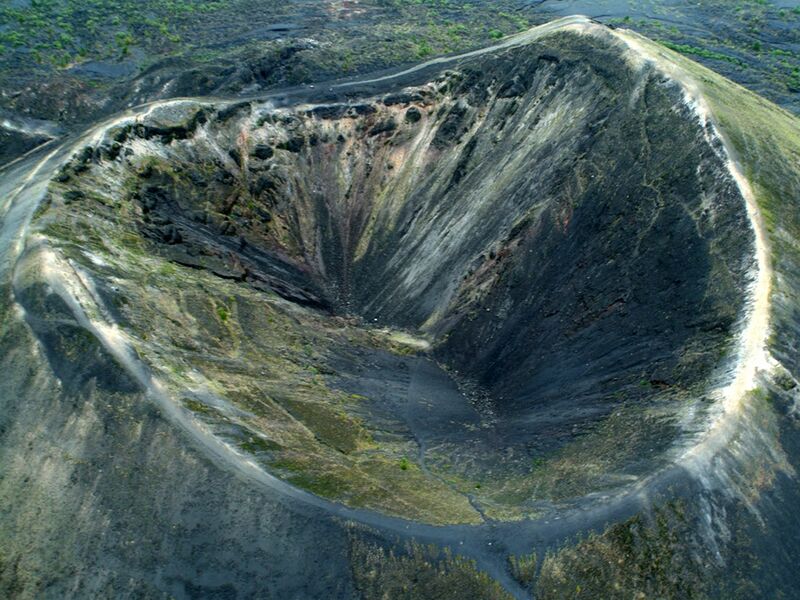 Paricutin is a cinder cone volcano located in the state of Michoacan, in Mexico, close to a lava-covered village of the same name. The volcano erupted on February 20, 1943, and continued erupting till 1952, during which it destroyed the villages of Parícutin and San Juan Parangaricutiro, burying both beneath ash and lava. San Juan Parangaricutiro’s church spire is all that remains of the village, poking out of the now solidified lava rock. Unlike most volcanoes, Parícutin volcano didn’t exist until that fateful day. This makes the volcano unique because it is one of the very few volcanoes whose birth has been witnessed by man. The volcano is located about 200 miles west of Mexico City, in the Michoacan-Guanajuato volcanic field, that contains about 1,400 volcanic vents. Paricutin is the youngest volcano to form in the Northern Hemisphere. For weeks before the eruption, the inhabitants of this village had been experiencing tremors and deep rumblings from the earth. On February 20, 1943 a farmer, Dionisio Pulido, and his wife Paula were burning shrubbery in their cornfield when they observed the earth in front of them swell upward and crack to form a fissure about 2 meters across. They heard hissing sounds and saw smoke rising from the fissure, which they later described as having a repugnant smell of rotten eggs. Dionisio Pulido was not sure what it was, but it frightened him enough to flee the scene. Incredibly, what the farmer unknowingly witnessed was the birth of a new volcano. The next day, Dionisio, along with several others from the village, went out at dawn to examine the site. What they saw both amazed and terrified them. Rocks and smoke were shooting into the sky while the cone was growing before their very eyes. After little more than a day the cone was already 50 meters high, and within a week it had reached 100 meters, and lava began flowing out onto the surrounding land. The eruption became more powerful in March, generating columns of smoke several kilometers high. The volcano was most intense during the first year when it ejected more than 90 percent of the total material spewed out by the volcano. The thick smoke, ash, sulfur fumes and lava made it unsafe for the people in the villages of Paricutin and San Juan Parangaricutiro to stay, and they had to be evacuated. By August 1944, most of the villages of Paricutin and Parangaricutiro were covered in lava and ash. Only the towers of the church of San Juan Parangaricutiro were visible above the lava field. Because of timely evacuation, no one was killed by lava or ash. However, three people died by lightning associated with the eruption. For the next nine years the volcano continued to erupt, although this was dominated by relatively quiet eruptions of lava that scorched the surrounding 25 square kilometers of land. In 1952, the eruption ended and Parícutin went quiet, attaining a final height of 424 meters (1,391 feet) above the cornfield where it began. Parícutin is believed to be a monogenetic volcano, meaning that it will never erupt again. It is classified as an extinct volcano. The cinder cone and the half-buried church are popular among tourists today. The birth of the volcano generated tremendous interest not only among scientist but the populace at large. Pan American planes between Los Angeles and Mexico City reportedly diverted from their regular route in order to be able to show passengers the new volcano. It even captured the attention of the silver screen. Shots of the volcano during its active phase were included in 20th Century Fox's film Captain from Castile, released in 1947. Satellite image of Paricutin volcano’s cinder cone.